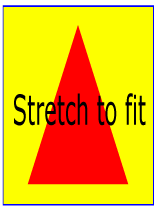 Using the above information, the SVG user agent determines the viewport, an initial viewport coordinate system and an initial user coordinate system such that the two coordinates systems are identical. Both coordinates systems are established such that the origin matches the origin of the viewport, and one unit in the initial coordinate system equals one "pixel" in the viewport. (See Initial coordinate system.) The viewport coordinate system is also called viewport space and the user coordinate system is also called user space. For the outermost 'svg' element, the SVG user agent determines an initial viewport coordinate system and an initial user coordinate system such that the two coordinates systems are identical. The origin of both coordinate systems is at the origin of the viewport, and one unit in the initial coordinate system equals one "pixel" in the viewport. In most cases, such as stand-alone SVG documents or SVG document fragments embedded within XML parent documents where the parent's layout is determined by CSS [CSS2] or XSL [XSL], the initial viewport coordinate system (and therefore the initial user coordinate system) has its origin at the top/left of the viewport, with the positive x-axis pointing towards the right, the positive Y axis pointing down, and text rendered with an "upright" orientation, which means glyphs are oriented such that Roman characters and full-size ideographic characters for Asian scripts have the top edge of the corresponding glyphs oriented upwards and the right edge of the corresponding glyphs oriented to the right. For elements which elements that establish a new viewport (see elements that establish viewports), plus the 'marker', 'pattern' and 'view' elements, preserveAspectRatio only applies when a value has been provided for viewBox on the same element. For these elements, if attribute viewBox is not provided, then preserveAspectRatio is ignored. A px unit and a user unit are defined to be equivalent in SVG. Thus, a length of "5px" is the same as a length of "5". 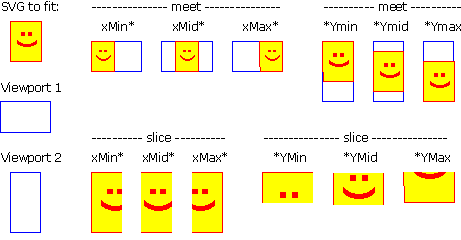 Note that use of px units or any other absolute unit identifiers can cause inconsistent visual results on different viewing environments since the size of "1px" may map to a different number of user units on different systems; thus, absolute units identifiers are only recommended for situations where the content contains no transformations and it is desirable to specify values relative to the device pixel grid or to a particular real world unit size. For any other length value expressed as a percentage of the viewport, the percentage is calculated as the specified percentage of sqrt((actual-width)**2 + (actual-height)**2)). 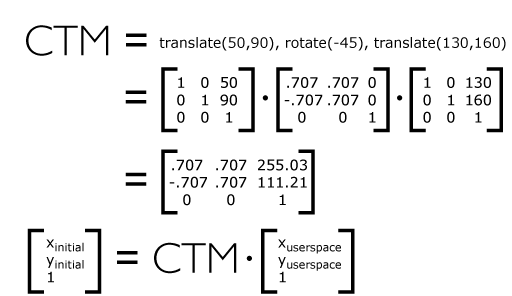 Note that the transform attribute on the 'g' element is ignored since the actual-width and actual-height are determined based on the user coordinate system of the viewport element.